After Prince Gabriel's christening at Drottningholm Castle, the official group portrait of family members and godparents of Prince Gabriel. 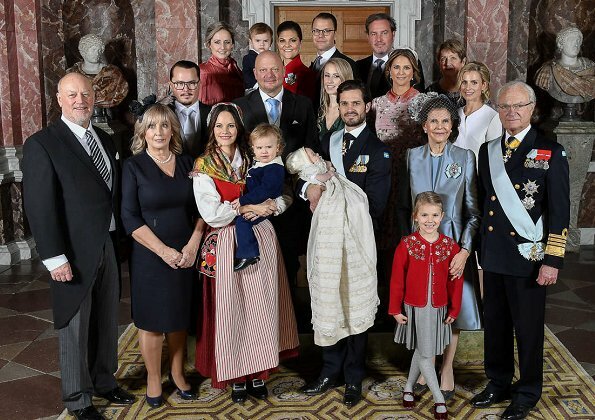 Left front row: Erik and Marie Hellqvist, Princess Sofia, Prince Alexander, Prince Carl Philip, Prince Gabriel, Princess Estelle, King Gustaf and Queen Silvia. Second row: Faddrarna Oscar Kylberg, Thomas de Toledo Sommerlath, Sara Hellqvist, Princess Madeleine and Carolina Pihl. Back row: Lina Frejd, Crown Princess Victoria, Prince Oscar, Prince Daniel, Christopher O'Neill and Britt Rotman. what a loveley snap. its a lot of harmony in it. Où sont les enfants de la princesse Madeleine? It's said the kids from Madeleine napped this one out due to jetlag after a us-trip. don't know why she takes the kids to a flight so shortly before such an important event.. I've noticed her children seem to run free all the time even during special occasions. Maybe it's a combination of jet lag and Madeleine concerned they may not sit still. I think it was only an excuse. Madelaine had an important role and maybe she wanted to pay attention instead of running after Leonore. This wasnt a judgement: I simply love Leonore. From what I understand the children were in London due to the previous trip to the US. Good parenting. The children wouldn't have added anything to the ceremony, and would probably have been disruptive, especially lively, lovely little Leonore. Missed seeing Leonore and Nicolas. I hope they were not left off because they could have been "disturbing" at the ceremony. Little prince Alexander wandered off, falled down and started to cry, disrupted the ceremony but its okay because Alexander isn't Madeleine's child and thus nothing worth mentioning? Toddlers are active, want to roam, not sit still but royal kids should behave differently? What a lovely happy gathering. Madeleines children where home in London due to jet-lag coming from USA recently. Madeleine and Chris where alone i Stockholm. Isn't it a fashion blog? We will never know where the children were, but that's their décision.